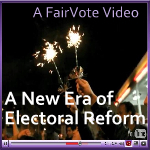 FairVote has developed and backed electoral reforms based on our vision of a democracy grounded in respect for every vote and every voice, including requiring all Members of Congress to be elected, ensuring all American jurisdictions have an option to purchase publicly owned voting equipment and establishing fair presidential nomination rules. The New York Times cited FairVote's leadership and research in editorials on September 10th on voting equipment and on August 25th on vacancy elections. Other national media citing FairVote's analysis include the Associated Press, while FairVote's analyses on voting rights have been published and distributed widely this month. 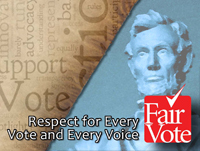 FairVote's testimony on comprehensive reforms of the presidential nomination process have been submitted to special task forces convened by the Republican and Democratic parties.